Diana Ptaszynski had a great idea, instead of a Tacky Christmas Sweater blog hop, a Tacky Holiday Earring blog hop! I was on it. I had ideas right away. I had so many I had to control myself. You can buy these for $15 each, too! Here we go! I found these awesome wreaths in the miniature Christmas section in Michaels, and they go perfectly with silver and copper colored plastic beads! These trees were found in Michaels, on an end-cap - I assume they are scrapbook or card making supplies, but make fantastic earrings. The holes were a little small and far down, so I had to make LARGE loops. Paired these with cute little gold colored jingle bells! And, finally, the ones I had in my head the moment she announced the blog hop. Dr. Seuss sparkly puff balls with ribbons. The only thing that would have made these better for me is if I could have found the red ribbons I really wanted to pair these with - don't get me wrong, the silver is cool and all, but in my head they were red. To me what ended up being the most fun part of the challenge was the creativity involved to get some truly tacky creations! I hope you enjoyed my earrings and you should hop around and see what everyone else made. Thanks Diana for having a fun little holiday blog hop! They are all so cute! Those wreaths and the grinchy ones are extra fabulous! Sue you did a great job on all of them! Those mini wreaths are brilliant! Love them all though. They are all adorable! I actually like that the last pair doesn't have red ribbons. It gets them more of a frosty look! Yes, the creativity of this is totally what makes it sound like fun! I can totally see someone wearing all three of your creations. I guess that's the point. However, there are some tacky sweaters out there that I can't believe people would wear...but they DO! Your idea of using miniatures is a great one. In fact, it sounds like a lot of fun to just walk around the craft store and pick out items for this challenge. You did fabulously! It's very fun to see the creativity that goes into all of these tacky earrings. Tacky but cute! Oh these are all pretty cute! I do love the pom poms and the wreaths a lot, but the Christmas trees are fab! I would wear them all. but the tree earrings are my fav. 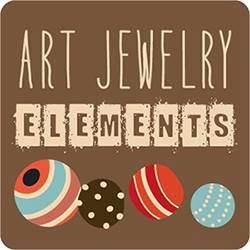 Art Elements Theme of the Month - Ornaments! Art Bead Scene Ornament Hop!